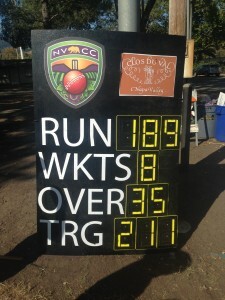 Napa Valley Cricket Club (NVCC) hosted the Sacramento Cricket Club (SCC) in Calistoga on Sunday, Aug 30, for the second encounter between the two sides of 2015. Sacramento managed to win a close game in the previous encounter in Davis, and NVCC were keen to make amends for a game it felt they ‘let go’. On a usually cool morning, NVCC won the important coin toss and elected to bat first. NVCC Club Captain Rob Bolch’s game plan was to put a big score on the board and force SCC. With this in mind Bolch sent out the opening pair of left-handed Australian Phil Bourke and right-handed Pakistani Moe Maqsood (Pakistan) to get the innings underway. Bourke and Maqsood made a breezy start, with Maqsood hitting a couple of impressive sixes in the first few balls. He went for one boundary too many and was out caught when the NVCC score was on just 14. This brought Indian born Bijoy Ojha to the crease and he combined with Bourke to take the score to 95 / 1 at the end of the 17th over, and the mid-innings drink break. This was a great start by NVCC, with both Bourke and Bijoy being very disciplined in their shot selection and playing only at balls that were there to be hit. After the break, Bourke was out quickly for a very good score of 24, and he was quickly followed by Ojha who was out for an equally solid 26. This brought Kiranpreet Singh and Club Captain Bolch to the crease with the score at 111 / 3. They managed to add 37 to the NVCC total before Singh was out LBW (Leg-Before-Wicket) on 23 – another solid innings from an NVCC top order batsman. Bolch was soon out for a patient 8 runs when the score was 156 when he mis-timed an off drive to present the easiest of catches to the cover fieldsman. NVCC ended up getting a total of 210 runs in their allotted 35 overs for the loss of eight wickets. Strong batting late in the innings by Bernie Peacock (11 runs off 15 balls), Moe Maqsood Sr (22 off 15), and Tim Irwin (7 off 7) helped contribute to NVCC’s impressive total. “It was a great effort in the end” said Bolch “with the outfield grass long and the field unusually slow it made scoring runs difficult. Some very good shots that normally would have gone for four were often only getting one and two runs” Bolch had set a target for the innings of 200 runs. “I felt we needed a score of 200 at least to put ourselves in a position where the pressure would be on the young Sacramento team to make a lot of runs on a slow outfield, and in the hot afternoon Calistoga sun”. After the Innings break, NVCC went about defending their score of 210 with the ball – and defend they did!! NVCC got off to a flying start with the opening four bowlers (Irwin, Maqsood, Peacock and Singh) ripping through the SCC top order to have them 5/47 at the end of the 11th over. It was a dream start for NVCC as not only was the bowling very good, but the fielding was also top drawer with Ojha taking two great catches at slip and gully. Wicket-keeper Bourke backed up his good showing with the bat with a very solid display behind the stumps stopping every ball that beat the bats of the SCC batsman. 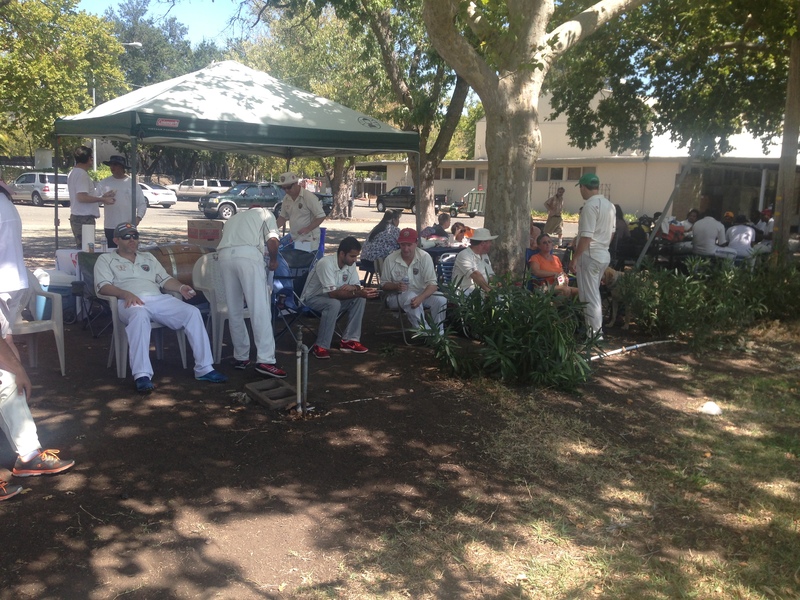 After the mid innings drinks break, SCC put their heads down and patiently chipped away at the NVCC score. 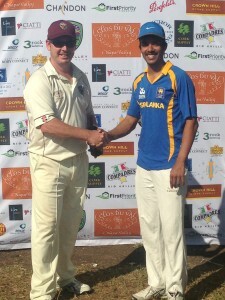 Bolch brought on Australian leg-spin bowler Pete Carson to try and break up the good partnership between SCC Captain Kavi and Naveen, who together had put on 64 runs to get their score to 177 / 7. And Carson delivered with a great leg spinning ball that got through batsman Naveen who was bowled for 18 runs. This was also at a crucial stage of the match as SCC had started to mount an unlikely comeback, almost single-handedly by their young left handed Captain Kavi. He who went on to score 102 runs with a fantastic display of clean hitting and some massive sixes over the leg side boundary. In the end it was not enough and NVCC’s great bowling and fielding restricted SCC to 189 / 8 at the end of their 35 overs, to give NVCC a 21 run victory. NVCC’s bowlers were solid with Maqsood 2 wickets for 29 run off 7 overs of left arm express pace, and Irwin 1 for 28 off 7 of right arm express pace. Peacock was solid, and economical as always, with 1 for 16 off 5, and the pick of the bowers was Singh who ended up with 3 for 49 off 7 overs to continue a very fine season of all round cricket with both ball and bat. Tony Parrish also bowled well with 0 for 27 off his 4 overs and Pete Carson got the figures of 1/2 off one over and the vital breakthrough late in the game! 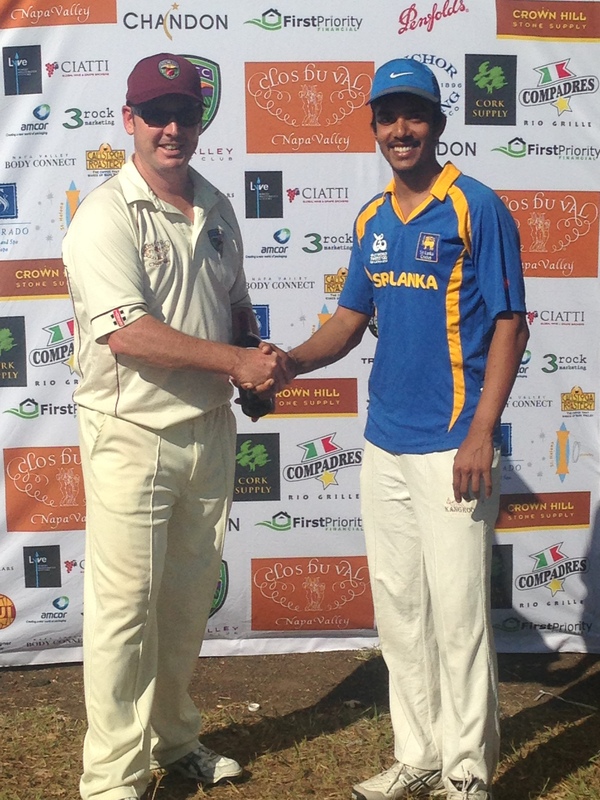 The Clos du Val ‘Man of the Match’ for SCC was their Captain Kavi for his brilliant 102, and also very good bowling. The Napa Compadres Rio Grill ‘Man of the Match’ went to Kiranpreet Singh for his great all round effort of 3 wickets for 49 runs and 23 valuable runs with the bat. A special post-game mention to Phil Bourke who scored 24 with the bat, and kept brilliantly behind the stumps savings many runs for NVCC. In fact, Bourke saved 23 runs more than SCC did behind the stumps, which had a big bearing on the outcome of the game. Napa Valley CC Batting – Bijoy Ojha 26 runs off 54 balls (3 x 4), Phil Bourke 24 off 56 (3 x 4), Kiranpreet Singh 23 off 26 (2 x 6). Napa Valley CC Bowling – Kiranpreet Singh 3 wickets for 49 runs off 7 overs including 1 maiden, Moe Maqsood 2 for 29 off 7, Pete Carson 1 for 2 off 1, Bernie Peacock 1 for 16 off 5 including 1.